It is no surprise to hear that car accidents are a danger to passengers, other drivers, pedestrians, motorcyclists, bicycle riders, and even bystanders. Fewer recognize another place where people can be at risk – inside buildings. While it may seem like a rare, headline-grabbing event, incidents involving cars crashing into building happen every day, injuring thousands and causing hundreds of fatalities every year. Our San Francisco injury law firm is concerned. Our team is dedicated to helping the victims (both the injured and the grieving) and preventing future tragedies. 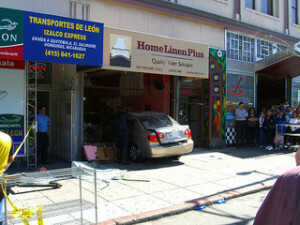 According to KRON, on Sunday afternoon, three people were taken to the hospital after an accident sent a vehicle crashing into a downtown San Francisco building. The crash occurred near the intersection of Sutter and Taylor Streets at around 1:45 PM. A fire department spokesperson confirmed that at least two vehicles were involved in the incident. One of the victims suffered serious injuries while the injuries to two others were described as minor. How common are collisions involving vehicles crashing into buildings? According to the Storefront Safety Council, vehicles crash into commercial buildings 60 times per day! These accidents leave more than 4,000 people injured and caus e as many as 500 deaths each year according to the group which is focused on spreading the word about the safety threat and helping to prevent future incidents. Notably, these numbers do not include crashes involving residential buildings. A quick internet search suggests crashes into homes are also a daily occurrence and a real danger to people and property. The Council reports that the number one cause of vehicles crashing into commercial buildings is pedal error (34%). Tied for second-place, the Council attributes 19% of storefront crashes to other operator errors and an additional 19% to DUI accidents. Other common causes include traffic accidents, medical issues, and “ramraid” (when someone purposely crashes into a building to commit a robbery). Avoid relying solely on standard car stops (usually six to eight inches) or curbs which are not effective barriers against a moving motor vehicle. Of course, drivers are also responsible for preventing these accidents and safe driving is critical to everyone’s safety. Prevention is ideal, but we are here to help when the unexpected occurs. If you were injured or lost a loved one when a car crashed into a building in San Francisco or elsewhere in Northern California, we are here to help. Call our experienced personal injury attorney in San Francisco, Oakland, or Santa Rosa for a free consultation.